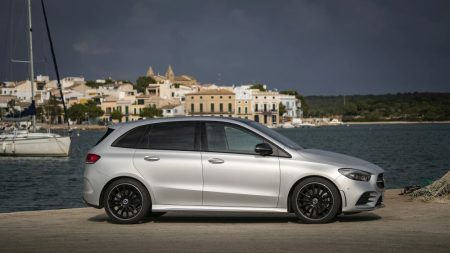 The third generation of the B-Class drifts away from the van design that many customers are starting to reject and is more of a sports tourer than an single-volume vehicle in terms of design and driving. 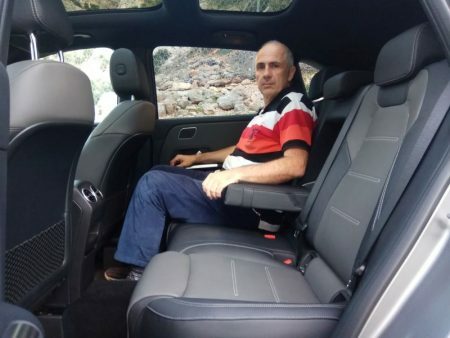 First impressions on the B 200 d powered by the new 2.0-liter diesel engine with an 8-speed automatic transmission, from Mallorca. Over 1.5 million units of the B-Class have been sold since the launch of the first generation back in 2005. In 2011, when Mercedes dropped out the sandwich platform in favour of the classic MFA platform, the B-Class remained the only offer in the company’s compact range with a higher driving position, being much appreciated by the elders. Now though, the idea of a compact van is outdated but Mercedes wanted to prevent the loss of an important customer share and resorted to a fortunate compromise. It kept the relatively high driving position and altered the design, converting this van into a very elegant sports tourer, that would be attractive to young families as well. The height is actually only lowered by 4 mm, but is still 90 mm higher than in the A-Class and there are different overall dimensions. The length extended by 26 mm, the width by 10 mm and so the B-Class features a more svelte silhouette. Additionally, the front track grew by 15 mm and the wheelbase went up by 30 mm, just like for the A-Class. The B-Class is built on the new MFA2 platform, being the second compact model in the range after the A-Class that gets the new architecture. It comes with improved rigidity, reduced noise level and better visibility, an adaptive drive train and a more generous interior space. Let’s take things one step at a time. The extended wheelbase led to more kneeroom at the rear, so that the passengers have as much kneeroom as in a compact SUV. The interior width gets 33 mm more, even though the exterior width only grew by 10 mm, because Mercedes changed the door design. The standard volume of the boot dropped from 488 to 450 liters, but resorting to the two-piece taillights as the A-Class, the opening is now wider and with the folding of the rear seats, the maximum volume of the trunk reaches 1,540 liters, only 7 liters less than before. The B-Class is standardly equipped with 40/20/40% splitable rear seats and with a variable boot floor, so that, in the upmost position, by folding the backrest of the bench, you get a flat load area. As for the former generation, starting mid-2019, 15-centimeter sliding rear seats with a backrest adjustable in various tilt angles, plus a front passenger seat with folding backrest, for loading very long items, will be optionally available. With the rear seats pushed all the way forward and with the vertical backrest, the volume of the boot rises from 455 to 705 liters. The dashboard is similar to that of the A-Class, except for the area in front of the front passenger, which is carved differently, as it is more straight and features no steps as in the A. There are thus provided two 7-inch standard displays, while the infotainment system features a touchscreen, a multifunctional steering wheel with left and right touch controls, two USB Type C ports and Bluetooth. A 10.25-inch touchscreen can be optionally ordered for the infotainment system, that can be combined with extended features for the MBUX system, such as voice control and WiFi HotSpot. The third option is the 10.25-inch display for the instrument cluster, case in which a touchpad and an HD navigation can also be configured. Also optional is the color laser head-up display, that shows data from the navigation, the radio, the dashboard computer on a wider and highly visible surface. Same as in the A-Class, there is an Augmented Reality option, that displays the indicators and the traffic lights in junctions and is extremely useful for orientation. The B-Class makes its debut with four engines, two of which are completely new, all of them being compliant with the most stringent of norms, Euro 6d-TEMP (the diesel corespond even to the Euro 6d which will be mandatory from January 1, 2020), being coupled with dual-clutch automatic transmissions. 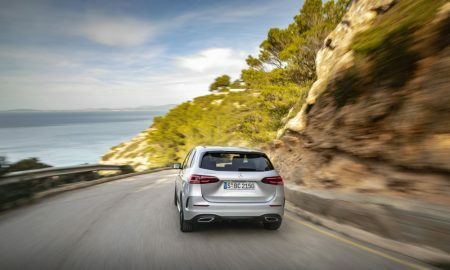 Along the B 180 and B 200, equipped with the new 1.33-liter petrol engine, developed together with the company’s partner Renault, providing 136, 163 horsepower respectively, the B-Class is also available with two new diesel 2.0-liter units with 150, 190 horsepower respectively. Various reflections in the infotainment display. It is the inline-four 2.0-liter unit launched with the E-Class in 2016 and recently mounted on the facelifted C-Class as well, that, in the B-Class is mounted transversely for the first time. Differently from the small gasoline engines, that are mated with the dual-clutch 7-speed transmission supplied by Getrag, the two diesels come with an 8-speed dual-clutch automatic transmission, especially developed by Mercedes for transverse engine mounting. The 9-speed automatic gearbox from the models with engines mounted longitudinally was too long and heavy, not fitting inside the transversal mounting outline. We must mention that the new Mercedes-sourced 8-speed automatic gear box is lighter and more compact than the 7-speed unit. We drove the B 200 d variant, that provides a great compromise and that will be a choice for many customers. As in the E-Class, the 2.0-liter diesel is refined and quiet and drags very well. The 320-Nm torque is also appropriate for long family journeys, as the B-Class is, first of all, a family car. The 8-speed gearbox is well decided when shifting, but shows slight hesitance when downshifting. It sometimes shifts too many gears down and other times when entering a bend, you fell like you need a lower gear. It is though above the 7-speed unit and well harmonizes with the diesel that features a very good torque at low revs. Apart from the former model, the B 200 is a genuine Mercedes, as it complies with the precious standards of the brand in terms of sound insulation. Mercedes claims that the articulation index that calculates how easy it is to hear the partner’s speech inside the car is 30% better. The car is indeed quieter at speeds of 140-150 km/h, like the larger Mercedes sedans. The wind noise is also very low, because Mercedes was concerned with the optimization of aerodynamics. As in the A-Class, the floor is fully enclosed, except for the wheel arches and the central area, where the exhaust system passes. 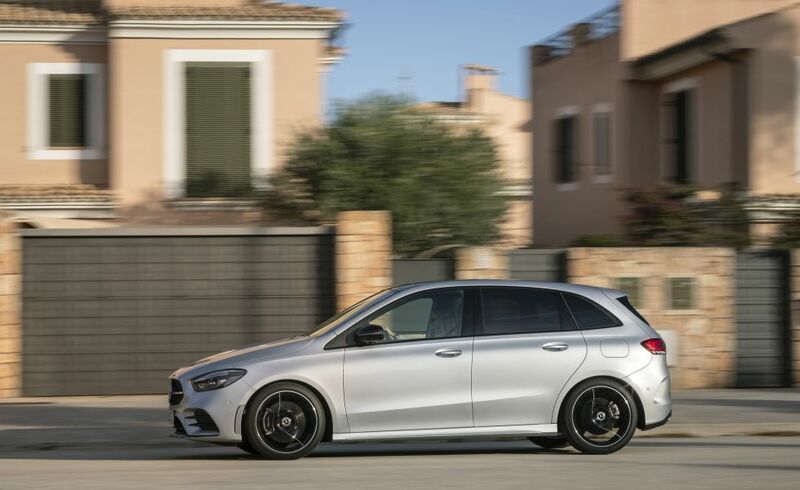 Therefore the B-Class features a Cd of 0.25 maximum (0.235 minimum), a best-in-class, and the Cd reduction compared to the former generation translates in terms of fuel consumption, with a 200-kilogram diet. Thus the fuel consumption went down by 0.14 l/100 km, according to the new WLTP standard and by 0.24/100 km on autoroutes, when the aerodynamics plays a major part. On a journey, the B-Class drives incredibly sharp. The new front axle McPherson architecture with the lower arm located beneath the wheel axle reduced understeering a lot. Even the model tested by us, featuring a front-wheel drive, understeers a bit and the lowered gravity center reduced roll and improved roadability. The B-Class does not have the inertia of a compact SUV and it drives like a wagon, which will surely magnetize young customers. The adaptive drive train with the modes Eco, Comfort, Sport and Individual is a welcome addition and optionally, the adaptive suspension with Sport and Comfort modes can also be ordered. The driving comfort matches the Mercedes standards, even when shod with 19-inch wheels as our test car was. In the Comfort mode, the B 200 d runs smoothly and the suspension mops up the small irregularities as well. In the Sport mode, the steering and suspension become stiffer and driving gets truly sporty features. As in the A-Class, the rear axle configuration does not depend only on the engine output. Combined with wheels of 18 inches minimum and with the adaptive suspension, the rear 4-arm independent multilink axle is delivered, the rest of the variants getting a semi-rigid axle. 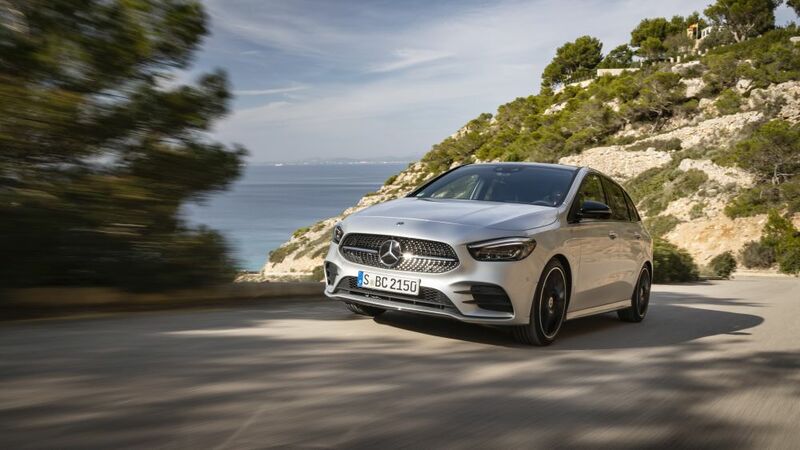 The equipment levels follow those of the A-Class: entry level, Style, Progressive and AMG Line, plus the Night package, available for the Progressive or AMG Line. 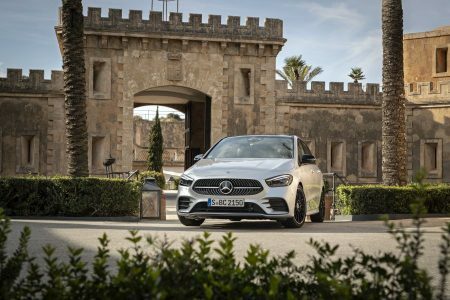 The prices are to be announced around the 10th of December, the B-Class being set to be manufactured at the Mercedes’ plant in Rastatt, Germany. 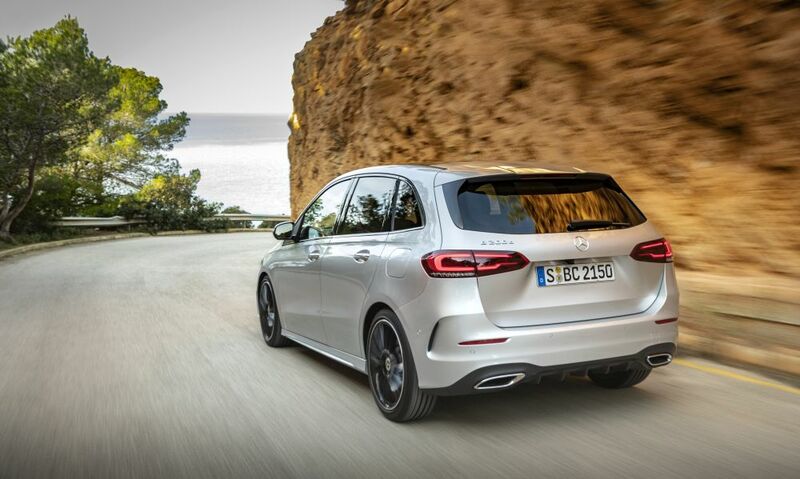 The new B-Class looks and drives sharper than its forerunner, as the new sports tourer concept is a successful one. The sound insulation and drive comfort reach the Mercedes standards and the new 2-liter diesel engine is a very good option, when coupled with the 8-speed automatic transmission, whose slight hesitance we pardon.